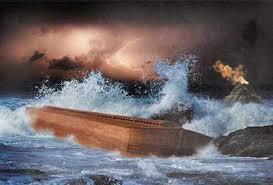 What Does the Flood Teach Us About God? As it so often happens in preaching, to make one point from the text of Scripture, requires glossing over another. This is especially true when working with large chunks of Scripture. Yesterday, I did that as I preached the Flood narrative (Gen 5:28–9:17). In that section, Moses records that God was ‘sorry’ that he had created man (6:6), which raises a whole host of questions related to God and his relationship to the world: Can God suffer? What does it mean that he is sorry? Does God change his mind? Does God know the future? Etc. As I mentioned those things in the message, my mind was thinking: “I am not spending enough time explaining this.” But since the goal was not verse-by-verse exposition but the exposition of the whole narrative, I pressed on. Still important questions remain about what Moses meant in Genesis 6:6. Whole revisionist theologies have been created on the basis of those questions. Open Theism, a view that denies God’s absolute knowledge of the future along with his foreordination of contingent events, arises from the emotional problem with evil and passages like Genesis 6:6 which on the surface insinuates that God changes his mind or grieves over mistakes in history. In yesterdays sermon, I did not get a chance to answer some of those questions, but here are a few places where I or others have addressed the subject of God’s impassibility and his relations with the world. This message kicked off a series on the holiness of God in the Old Testament. Admittedly, the message focuses more on God’s justice and mercy than his holiness per se. Nevertheless, as the first major display of God’s action in redemptive history (post-fall), it displays a vital reality: In his holiness, God is dreadfully severe towards sin and awesomely gracious towards his covenant people (cf. Rom 11:22). ← What’s Going on in Genesis 1–11?